Classter enables you to set up central management of multiple institutes or academies, while each institute can have its dynamically defined terminology and structure. School registration management can be a time-consuming and complex task. However, using Classter will allow you to easily and effectively handle school registration and student enrollment to several educational programs and curriculums. Additionally, with Classter, you can easily manage your student’s multiple and complex registrations, while you can maintain student status. In an effort to improve your daily life, Classter development team has designed a detailed card for the different categories of students, teachers, parents, employees or other contacts. Store all the needed information within this detailed card, from personal and academic data, to behavior, certificates or medical information. Another important aspect is that Classter offers advanced curriculum tools. Thus, curriculum development will not only become an easy process, but it will also meet the individualized student’s needs. Moreover, Classter offers you the possibility for effective management of extra-curricular activities, such as afternoon courses or sports activities that your school might offer. Classter has an advanced group management tool, that allows students to be enrolled to multiple groups and attend one or more subjects. Tools for mass group subject enrollment are also provided. Apart from that, the software allows you to manage additional services, as for instance the organization of trips, excursions, seminars, lunch, accommodation or activities like studying abroad. Timetable management is another important feature of Classter. The tool supports multiple timetables creation per teacher and group or per classroom and group. Moreover, via Classter timetable management feature, you will be able to manage your time and schedule effectively, check classroom availability and constrains, while students, parents and teachers can easily check and download their weekly timetable. Classter is a valuable tool offering the possibility to manage multiple academic periods and make year-to-year transfers, while you can automatically assign students to the correct location, level, grade or year. What is more, Classter can serve as a document management system, allowing you to maintain document libraries associated with students, teachers, groups, courses, activities and other features included in the software. 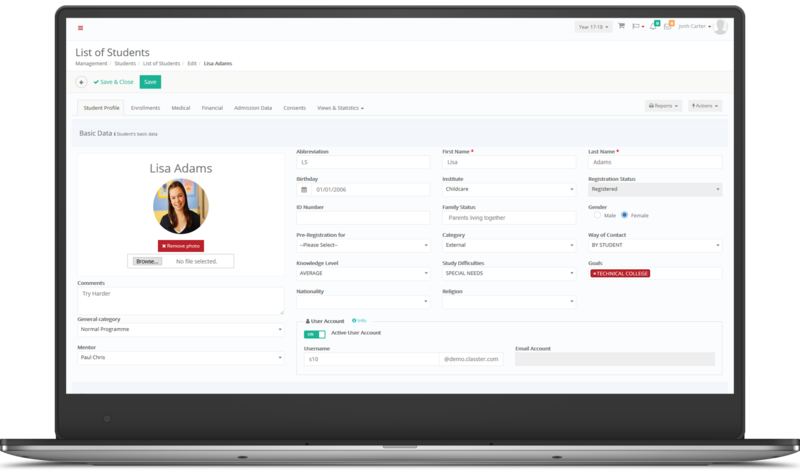 Use Classter to gather all your contacts including employees, suppliers, external companies and other academies or any other type of contact. 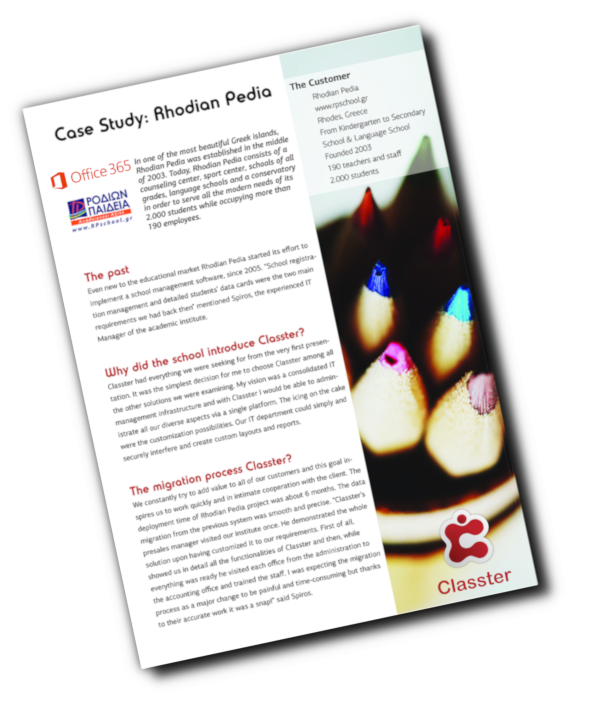 Enjoy the full functionality of Classter, as the software is integrated with Moodle LMS and Office365. In addition, Classter's BI tools will allow you to track your school’s progress. Moreover, Classter offers an Open Web API for common operations for 3rd parties’ integration. Customize your reports, lists and layouts to meet your needs and requirements. Create your reports via the Report Builder tool and export them massively. Furthermore, Classter' s template manager will allow you to customize all the communication sent to end users such as students, parents and teachers.